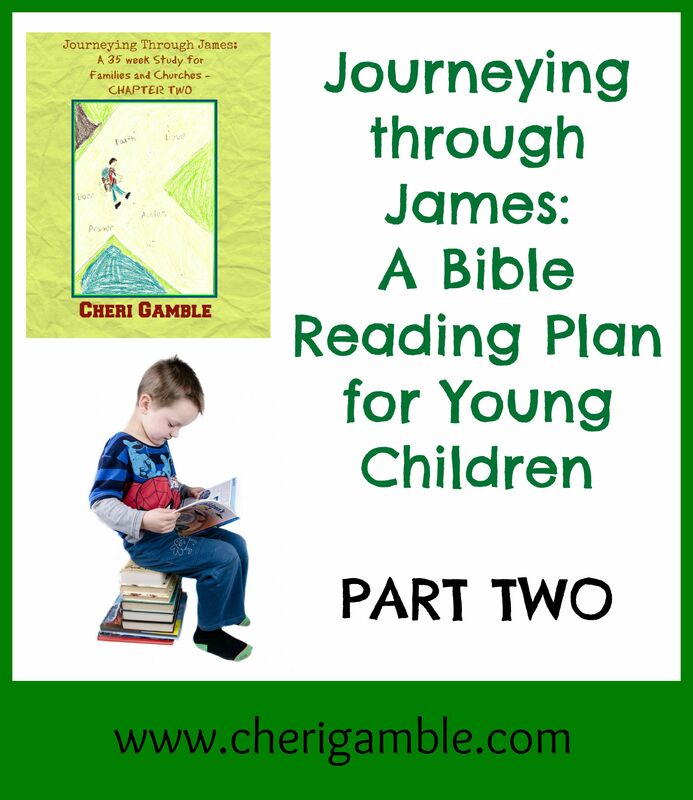 This is a Bible reading plan for young children over the second chapter of James. It includes Scripture, crafts, snacks, videos and more! Welcome to Part Two of Journeying through James for young children! We are continuing our Bible reading right where we left off . . . on James Chapter 2. This plan is 8 weeks long and contains suggested Scripture readings, crafts, snacks, videos and more to help your child grow closer to Jesus and learn God’s Word. If you have older children or teens, you can find a plan for them here. ___ Day One: James 2:1-4. Read these verses to your child and then discuss what it means to show favoritism. Aren’t you glad that God loves EVERYONE? He doesn’t show favoritism and neither should we! Have your child help you gather props to go along with these verses. For example, he might choose a ring, a footstool, a torn coat, etc. Have him use the props to retell the message from the verses. ___ Day Two: Genesis 37:3-4. In these verses, Jacob loved one of his sons more than the others and he showed it by giving that son a special gift. It is not good to show favoritism, yet Jacob did, and it led to a lot of trouble in his family! Help your child make a torn paper coat to remind him of this story. Have him tear up several pieces of colored construction paper and then glue them on an outline of a coat. You could also do this using a paper bag and make a Joseph puppet. Then have your child use the puppet to tell others why it is not good to show favoritism. ___ Day Four: Romans 10:11-13. These verses remind us again that EVERYONE who calls on the Name of Jesus can be saved! Make a paper chain of people with your child. Help your child cut out the people and then draw and color them in to represent that Jesus loves people of every race and ethnic group. He does not show favoritism! ___ Day Five: James 2:1-4. Bake and decorate a dozen animal cookies and take them to a neighbor who needs to know about Jesus. Invite the neighbor to church! ___ Day One: James 2:5-7. What does it mean to be truly rich? Being rich is not about how much money you have – you can have a lot of money and still not be “rich”. Being rich is about your relationship with Jesus! No matter how much or how little money you have, if you have JESUS, you are truly RICH! Help your child design his own special money today. Have him decorate the money with ways that he can be truly rich. Find a template here. Make a craft using your child’s handprints! Cut your child’s handprints out of green construction paper. Then help your child draw a river with a basket and a baby on another piece of paper. Glue the handprints on the paper to cover the basket (but make sure you can still pull them down to see the surprise behind them!) The handprints are the bulrushes . . . remind your child that God had a plan for Moses, and God has a plan for him, too. ___ Day Three: Luke 16:19-31. This is a longer passage of Scripture, but it is hard to break this story up! If your child is having a hard time sitting through the reading, simply tell him the story of what happened. Then remind your child that what matters in life is not how much money you have but how much you love Jesus! Make an “I love Jesus” craft with your child . . . and let’s use his handprints once again! This time, paint his hands (or you can cut them out of construction paper if you don’t want the mess) and put his handprints on a piece of paper in such a way as to make a heart out of them. Then help your child write the word “I” above the heart and “Jesus” below the heart. Let him decorate the rest of it (perhaps by gluing special items around it in the shape of a heart!). ___ Day Four: 1 John 3:17-18. One way that we can show that we love Jesus is by loving others . . . especially the poor people that we see all around us! What are some things we can do to help the poor? Go through your canned goods with your child and help your child select some food to give to a local food pantry. Have your child make a special card to give as well. Make plans to drop this off tomorrow! ___ Day Five: James 2:5-7. Take your bag of canned food and the card that your child made and to a local food pantry! ___ Day One: James 2:8-10. What do you think it looks like to “Love your neighbor as yourself”? Make a cute “Love” sign using buttons and your child’s handprints to spell out the word “love” and to remind your child that God wants us to love others. ___ Day Three: Luke 10:25-37. This is a fun passage to act out! You can act it out with your child using real people, or let your child act it out using toys to stand for each person in the story. Tell your child how Jesus wanted to make sure we understood that loving our neighbor means loving EVERYONE . . . even those people who are different than we are! Sing this Good Samaritan song with your child! Give your child a bandaid and let him decorate it in ways that will remind him to love EVERYONE! ___ Day Four: Galatians 3:23-29. Help your child understand grace by playing the law versus grace game found in this lesson. Then make a cross craft with your child to help him celebrate the gift Jesus gave when He died on the cross for our sins. ___ Day Five: James 2:8-10. Do something special for your neighbors this week. Make them a special treat, rake their leaves, or shovel their sidewalk. Practice loving your neighbor as yourself! ___ Day One: James 2:11-13. This week we are going to be talking about mercy. Do you know what mercy is? It is when you don’t get something that you deserve. For example, if you do something bad and deserve a big punishment but your parents don’t give you the big punishment, they are showing you MERCY. Mercy is a wonderful thing that God shows to each one of us. We all deserve to be punished for our sins, but God sent JESUS to take that punishment for us. He showed us MERCY! Make a cross snack today to remind you of how God has given us MERCY. Cover a graham cracker with white frosting. Then use any other food you have on hand to make the shape of a cross in the center of the graham cracker. You can use licorice sticks, chocolate chips, m&m’s or skittles. If using m&m’s or skittles, use one color to make the cross and then use the other colors to decorate the background. Eat your snack while thanking God for His mercy to you! When Jesus takes away our sins, we become super CLEAN. Psalm 51:7 says it is like we are WHITER THAN SNOW! Make your own snow today! If you actually have snow on the ground, spend some time playing in it today! See this link for an extra lesson with ideas on this topic. ___ Day Three: John 8:1-11. Jesus showed MERCY to the woman who was caught in a sin! He shows us MERCY, too! Start your own “Mercy” rock collection! Gather several rocks and then paint and decorate them to remind you of God’s great love and mercy to you! ___ Day Four: Matthew 9:9-13. Jesus loves EVERYONE, and He wants us to love EVERYONE, too! Help your child make his own doctor kit! Then let him pretend to be a doctor on you . . . his siblings . . . his stuffed animals . . . anyone who will let him! What should he prescribe for all the people he sees? MERCY! ___ Day Five: James 2:11-13. Do you remember what MERCY is? Write the word “MERCY” on a piece of cardstock in bubble letters. Fill the bubble letters in with colored sand, tiny pebbles, fingerprints, food, or anything else you want to use! ___ Day One: James 2:14-17. Help your child act out the situation mentioned in verses 15-16. Take turns playing the brother in need and the person who does nothing. Have fun with it – but stress to your child that it is important that we DO something with our faith, too! ___ Day One: James 2:18-19. These verses tell us that we need to believe in God AND obey God! Write the words, “I obey God when I ___________” on the top of a piece of paper and let your child fill in the blanks. He can draw pictures or write words of different things he does to obey God. Make a Jonah and the whale craft with your child. ___ Day Three: Mark 5:1-13. This passage shows a man who had several demons living inside of him. It is obvious that these demons believed in Jesus – they knew who He was and they were afraid of Him! This is exactly what James 2:19 is talking about! It is not enough to BELIEVE in Jesus, we also need to OBEY Him! Make a pig in the mud (or you can pretend it’s the sea) snack today. ___ Day Four: Hebrews 11:32-34. These verses show us people who had faith AND actions! They believed God and He helped them DO great things! Take a picture of your child. Then help your child make a frame for it out of craft sticks, puzzle pieces, or other odds and ends that you have around the house. Write the words, “I can do great things for God” on the frame. (Or have him hold a sign that contains those words when you take the picture). Hang the picture in your house somewhere and remind your child that he CAN do great things for God! ___ Day Five: James 2:18-19. Think of another way to put your faith into action and then DO it! 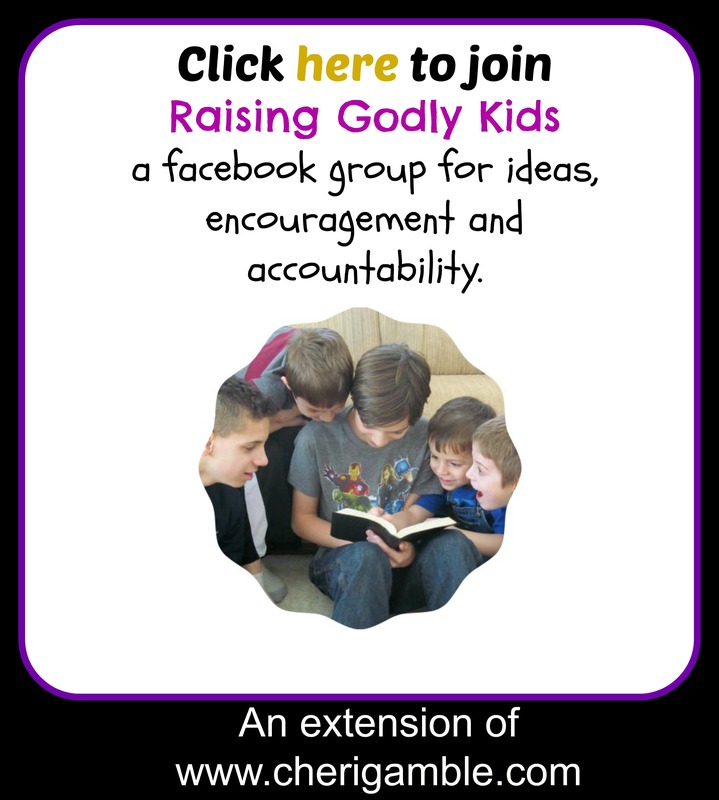 Parents: if you want, take pictures of your kids putting their faith into action and then share the pictures at our facebook group, Raising Godly Kids. ___ Day Two: Genesis 22:1-2, 9-14. In these verses, Abraham put his faith into action even when it was really, really hard! He did not know what would happen or why God asked him to do this, but he obeyed God and God helped him and saved Isaac! We need to be willing to obey God . . . even when it is hard! Give your child pretzel sticks and cheese cubes (or any other food you have on hand) and let him create an altar with his snack. Talk with him about obeying God, even when it is hard. ___ Day Three: Acts 9:10-17. In these verses, someone else was asked to do something DANGEROUS for God. Who was it? What was he asked to do? Why was this dangerous? Ananias did what God asked him to do, and in this way, he was the hands and feet of God! We can be God’s hands and feet, too! Make a hands and feet craft with your child. Outline his handprint and footprint on a piece of paper and then let him fill the outline with pictures of how he can be the hands and feet of God. ___ Day Four: Matthew 28:18-20. What does God want US to do? How can we do this? Help your child make a painting of the world! Draw the shape of an earth on a piece of paper and let him paint it blue, green, and brown using q-tips! Then spend time praying for people around the world to hear about Jesus! ___ Day Five: James 2:20-23. Make handprint or footprint art to remind you to follow Jesus wherever He tells you to go! Make a handprint campfire to remind you to obey Jesus even when it is hard (like Abraham), or a footprint butterfly to remind you that when you follow Jesus, He will help you to SOAR! Find both here. ___ Day One: James 2:24-26. Rahab showed that she had faith by hiding the spies! Pretend to be a spy today! Disguise yourself in a fun costume and then play a game of hide and seek! Make yourself a fake mustache by cutting out a mustache and taping it on a straw. Then you can hold the straw up to your face for a cool disguise! ___ Day Two: Joshua 2:1-7. This tells us more about how Rahab hid the spies. She could have gotten into a lot of trouble for what she did . . . . but she did it anyway. She did what was right by helping God’s people, the spies! Make a fun spy sandwich with your kids. ___ Day Three: Matthew 14:22-33. How did Peter put his faith into action in this story? He got out of the boat! Act this story out with your child . . . help him make a boat out of whatever he wants and then get in the boat and act the whole thing out! Find storm sound effects here. ___ Day Four: Ephesians 2:8-10. You are a MASTERPIECE! God created YOU to do good works for Him! What are some good works you think God might want you to do? Help your child draw a picture of himself doing great things for God! When you finish this Bible reading plan, be sure to continue on with James Chapter Three! May God bless you as you follow Him!